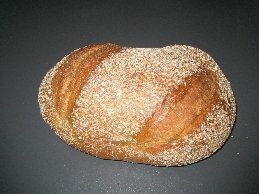 There are many delicious German bread recipes. Walk into any baker in Germany and you are spoilt for choice. Germans are the biggest consumers of bread worldwide and pride themselves on having the largest variety available. It is not surprising as the Germans eat bread for breakfast, lunch and for their Brotzeit in the evening. Not forgetting the children taking it in their lunchbox for their mid morning snack. Kartoffelbrot or potato bread is one of our favourites. It is very easy to prepare and as with all bread recipes, not too many ingredients are required. Peel and wash the potatoes, leave them to drain and then grate them finely. Place the grated potato in a bowl and pour over 100ml boiling water. Mix the flour with the dried yeast and salt. Add the potato and the egg to the flour mixture and knead the mixture together thoroughly. Cover the bowl and leave in a warm place for 30 minutes. Preheat the oven to 225 degrees C (about 450 degrees F). Place the potato dough on a floured work surface and knead once more. With floured hands form a round bread shape from the dough. Place the potato bread on a baking tray lined with baking paper and place in the centre of the oven. Spray a little water in the oven and close the door immediately. Bake the potato bread for 20 minutes. Then reduce the heat to 200 degrees C (400 degrees F) and place near the bottom of the oven. Bake for another 30 minutes. To test whether the bread is baked through knock on the bottom of the bread with your knuckles. It should sound hollow. I hope you enjoy my German bread recipe. I will be adding to this page so make sure you come back for another look.